Around the age of 40, most people begin to notice fine print is more difficult to read, according to the University of Michigan's Kellogg Eye Center. Bifocals are lenses that have two types of vision correction, also called power: one for distance and another for helping to see better up close. A bifocal prescription is converted to single vision lenses by either combining the powers into a reading lens or removing the reading part of the prescription for single vision distance lenses. Familiarize yourself with optical prescription protocol and terms. The Ohio State University Medical Center notes that every prescription is written with an O.D. (Oculus Dextrous) for right eye and O.S. (Oculus Sinister) for left eye. Some prescriptions will include numbers under the category of Cylinder and Axis for each eye, but not all. Bifocals will always have a number written under the category of ADD or Addition on a glasses prescription. Begin with the right eye. All optical processes start with the O.D. first. Add the power of just the Sphere, or distance in the right eye. For example, if the prescription is O.D. Sphere +2.00, Cylinder -0.50, Axis 180 with a reading ADD of -1.00, during conversion you disregard the cylinder and axis until later. Add +2.00 and the reading ADD of +1.00. The beginning of the reading prescription is now +3.00. Continue with the conversion by adding back in the Cylinder and Axis, so the O.D. is now +3.00 Cylinder -0.50 and Axis 180. Repeat with the left eye, or O.S. Add the reading prescription power to the left distance power and keep the Cylinder and Axis the same. It is possible to end up with a negative number in the Distance power. If a person's Distance prescription is written as -4.00 and their ADD is +2.00, his reading power is calculated to -2.00. 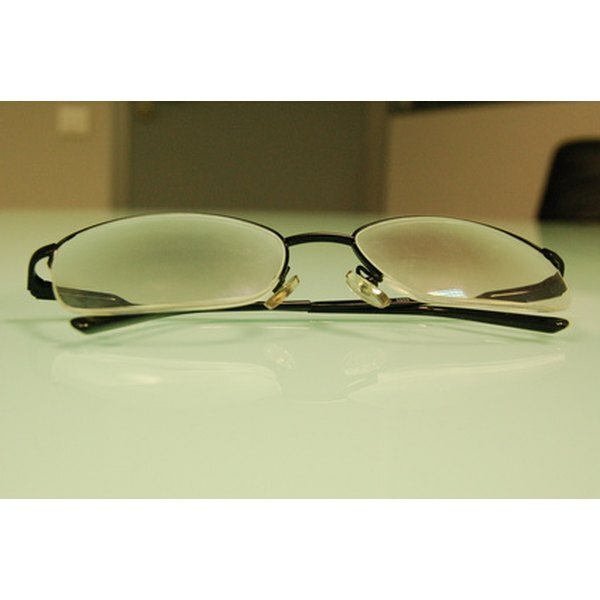 According to opticianworks.com, the magnifying power or ADD power can be reduced minus power. Remove the ADD power from the prescription. This is done by rewriting the prescription as a single vision order. Note on the lab order form next to the bifocal prescription that the order is SVO, which means Single Vision Only or as DVO, for Distance Vision Only. Most labs know to make single vision lenses from a bifocal prescription if the order form includes instructions for DVO. Mark the lenses as SVO if you are sending a previously worn bifocal pair of lenses to the lab for single vision. Use a permanent marker only if you do not intend to re-use your bifocal lenses in the future. Simply make an "X" on the bifocal portion of the lens or write "SVO" across each lens to alert the lab that the new lenses will be made into single vision. Sometimes, specific situations are taken into consideration when converting a bifocal prescription to reading or single glasses. If your work is at arm’s length or extremely close, the power of the lenses may be adjusted. Experienced licensed opticians and eye care professionals will usually help convert a prescription for little or no charge. Prescriptions for glasses may not have any numbers written under Cylinder and Axis or just have the numbers written for one eye. Cylinder and Axis reflect astigmatic correction, and many people do not have the correction or only have astigmatism in one eye.